The inside of the Thai restaurant has sections divided off in nestled open concept rooms which add a nice ambience. The entire place is filled with very ornate and beautiful Oriental decorations. Right above where I was sitting there were two stuffed blowfish that you would likely be able to find only in the Orient. Although the restaurant has probably seen its better days, it’s been a favourite of Thai food lovers in Barrie for many years now. In the summer the patio is absolutely fantastic; it’s in fact probably one of the largest I’ve seen downtown. 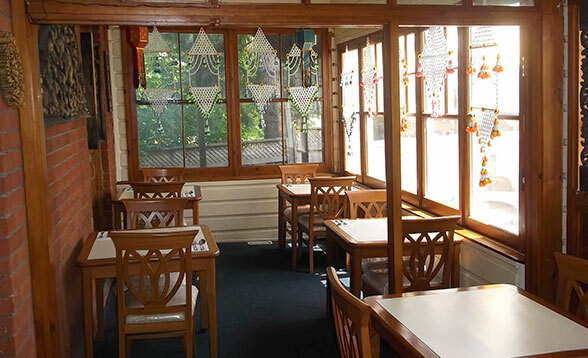 Because the restaurant is a little nestled from the busy Dunlop street, the restaurant affords you to have a very easygoing and quiet lunch or dinner on the patio. The food at Chaopaya is very exciting, tasty and very affordable too. They offer main course dishes ranging from the $10 mark up to around $16 for the duck stir-fry. I was able to try two Thai curry dishes and a very generic chicken stir-fry meal. Both curries were very flavourful, not too spicy and quite filling. Even though the curry is considered to be medium spice level, the servers let us know that they can be made hot or very hot. I’ve been to a few Thai restaurants and the medium spice was perfect for me. Thai curry isn’t much like its Indian counterpart; it tends to be lighter and oily as opposed to a thick and pasty Indian curry. Either way it makes for a lighter healthy dish that tastes great. 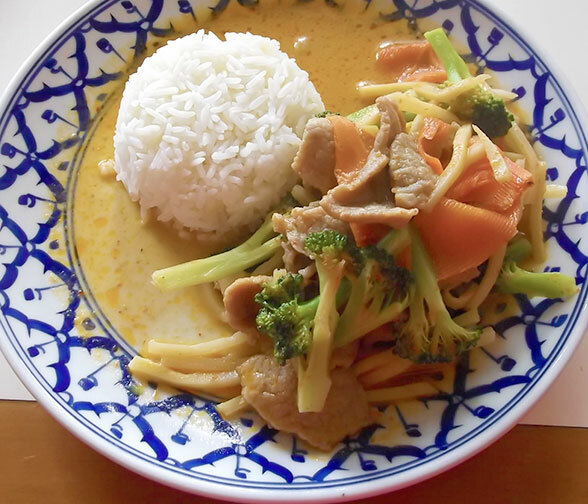 Both the Red Beef Curry and Green Chicken curry are made with a coconut curry sauce. The Chicken with mixed vegetables came with broccoli, bamboo and carrots, as did most of the other meals. However some of the other dishes were a little different like the Golden Curry Chicken and Tamarind Curry Beef with potatoes or the Chicken with Peanut Sauce with peppers and onions. Sadly, I did not try the Duck with Ginger which is one of the most expensive dishes on the menu but looks absolutely fantastic. Most dishes are served with rice making the overall bill very affordable. But what’s more, if you go there for lunch, many of the main course meals are offered at a reduced lunchtime price of $9.95. The lunch dishes are also served with a small hot and sour soup and spring roll as an appetizer. It’s quite a deal. As far as Thai restaurants in downtown Barrie, Chaopaya is easily the best value for your money, and the food is just great and the atmosphere is very charming. If you’re looking for a quick, light and healthy lunch option, Chaopaya might be a little bit away from the main part of downtown but it’s worth trying. Dinner at Chaopaya is also great and even checking out the patio for afternoon drinks with a few friends would be quite relaxing as well. It’s a very nice spot. I liked it, and for now, it’s my go to place for Thai food in Barrie. If you haven’t yet, you should definitely try it.